Waste Management Review reports on how some hospitals are partnering with waste and reuse organisations to reduce costs. When someone’s life is on the line, or a child is being born, proper waste management and recycling practices can be placed lower on the priority list. According to the World Health Organization’s fact sheet on health-care waste, a lack of awareness alongside the absence of waste management and disposal systems and insufficient financial and human resources are some of the most common problems facing hospital waste. The organisation adds that of the total amount of waste generated by health care activities, around 85 per cent is general, non-hazardous waste. Kristina Roberts, Afterhours Manager at Auburn Hospital in Western Sydney, says that there has been a cultural shift towards the use of single-use plastics in medical centres. “Plastic packaging and tools became more popular in hospitals, as they are perceived to be quicker and cleaner to use,” she explains. “This is also true for more mundane items, such as water bottles. Years ago, patients would have access to a refillable plastic jug for water, but these have been replaced by plastic water bottles. Staff at Auburn has begun to notice the amount of recyclable materials that were being sent to landfill. More than 2500 single-use kidney dishes were being disposed of every month at the hospital, which ended up costing hundreds of dollars in waste fees. In November 2017, a group of committed staff decided to go beyond their expected roles and began the “Think before you bin it” program. It encourages staff at Auburn to consider how waste could potentially be diverted from landfill before disposal, with staff educating others about what can be recycled. To further improve recycling rates, the hospital partnered with MedEarth and Doctors Assisting in South Pacific Islands, which collect equipment such as crutches, maternity beds, incubators and surgical supplies, masks and suture materials for reuse in African and South Pacific nations. Kristina, who leads the team behind the project, says one of the hardest things for the hospital was setting up contacts and relationships with organisations willing to assist their recycling efforts. “We reached out to the companies that were providing us with the blue plastic bowls, and they agreed to collect and recycle them as long as they were clean,” she says. The team’s efforts have seen a significant increase in recycling rates, recycling 100 per cent of recyclable plastic bottles and cans, 98 per cent of the hospital’s blue plastic bowls, 90 per cent of kidney dishes and galley pots and 90 per cent of “out of date” consumables. One waste problem Auburn is now aiming to solve is food waste. Healthshare NSW provides around 24 million meals every year for patients in hospitals across the state. However, not all of these meals are eaten and leftovers are unable to be given to food rescue charities due to the potential infection risk. Like many hospitals, Auburn doesn’t have the space for its own dedicated composting on site, meaning much of this food waste ends up in landfill. Something Kristina says would make it easier for hospitals to recycle is a collection service. “One of the big logistical challenges was figuring out where to store the items we were wanting to recycle,” she says. Flinders Medical Centre (FMC) in South Australia is another example of a hospital that has benefited from establishing partnerships with other waste and recycling organisations. The hospital was generating a significant amount of waste daily, with around two-thirds being potentially recyclable. However, the issue the hospital faced was clean plastic waste being mixed with medical waste, contaminating the entire stream. Darren Bradbrook, Associate Nurse Unit Manager of Anaesthetics at FMC, believed there was more that could be done to recycle and raised the question with his managers. This eventually led to a partnership with SUEZ ResourceCo to help develop a bin disposal system for clean plastic. 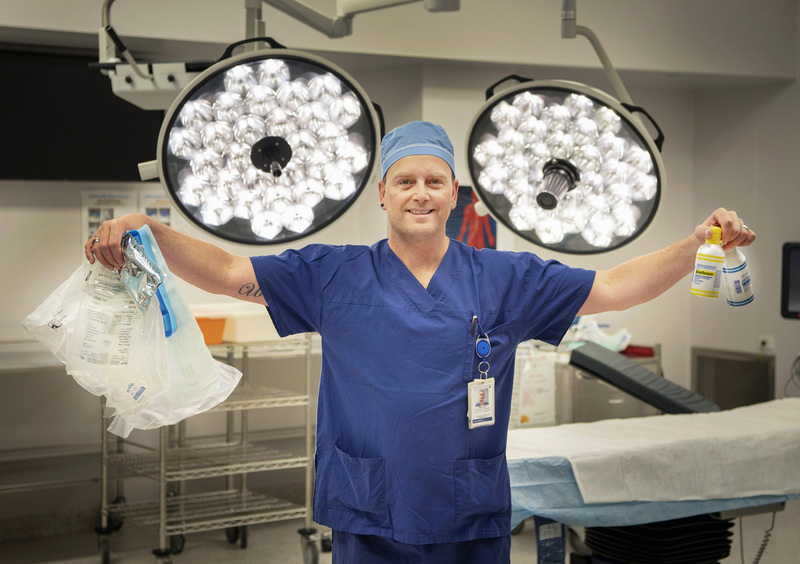 Within a year, the operating theatres alone had recycled more than 450 cubic metres of plastic and reduced the area’s daily output of general waste from 12 to four 660 litre bins. Plastics collected from FMC are taken to SUEZ ResourceCo’s multi-resources facility in SA, where they are turned into a processed engineered fuel for local industry, reducing fossil fuel use by around 30 per cent. Darren explains that without the partnership with SUEZ ResourceCo and the support of Southern Adelaide Local Health Network (SALHN) executive, divisional directors and local managers, the programs FMC started would not have been possible. “With disposable and single-use items contributing to a huge volume of waste, partnerships with waste management companies provided options and pathways to recycle or renew it into something more than simply burying it as landfill,” he says. He recommends other hospitals get in touch with their local health networks and establish a team that is passionate about sustainability and recycling to build support and to establish a plan. Since the success of the initial project in operating theatres, a green team committee was formed to discuss waste solutions and movements within the local health network. The green team has gone on to spark further discussion and have been pivotal in supporting the expansion of the initiative across all departments within SALHN. The team’s goal is to be the first hospital-wide facility engaged in this type of recycling to put a dent into the amount of plastic sent to landfill each year, with the ultimate goal to transition a similar model to SA Health in its entirety. Mark Walker, Manager of Corporate Services and Contract and green team committee chair, says it’s important to remember that every hospital or health facility will be different, and the cost benefits of waste reduction will be different for each. “Any facility interested in participating can receive modelling on potential savings from service providers. Reach out and start a conversation,” he advises. Photo credit: Southern Health News.